Located in the centre of Abu Dhabi, this 16ha site encompasses some of the country’s most significant heritage buildings: most notably the Qasr Al Hosn Fort, an early example of Emirati Culture. Working as the lead masterplanner, our proposals for a significant new public space create an inviting and engaging place that embodies the qualities of Emirati culture; specifically, the relationship between inland oases and the shoreline of the Gulf. In our design, the garden is placed above a terraced theatre bowl that uses the Qasr Al Hosn Fort as its backdrop. The bowl wraps its form around a dry rocky wadi bed that makes reference to the gravel landscapes found close to the Hajar Mountains. The wadi leads into a sculpted landform that provides the park with its largest event space. Its soft sandy form evokes both the landscapes of the desert and the Gulf’s shoreline. Adjacent to the central avenue are spaces which replace the Al Nahyan Mosqure. Above the Souq, a ‘Quran Garden’ is proposed as a paradise garden with educational references to the trees and plants mentioned in the Quran. Referring to early aerial photographs of Qasr al Hosn, the settlement developed as a series of individual fenced smallholdings gathered around the fort. The landscape adjacent to the Souq and Shoreline Quay references this and takes the form of a series of loosely aligned rectangular rooms embedded into the landscape. Their simple shape and orientation appears as an archaeological excavation derived from the origins of the city. The shade offered by trees and majlis canopies provide outdoor ‘living rooms’ in which friends and family groups can meet, picnic and socialise. Their form can be seen to sit on top of the desert landscape as carpets laid out as a sign of welcome and hospitality. During festivals the rooms can offer stages on which a wide variety of smaller scale cultural activities can take place. 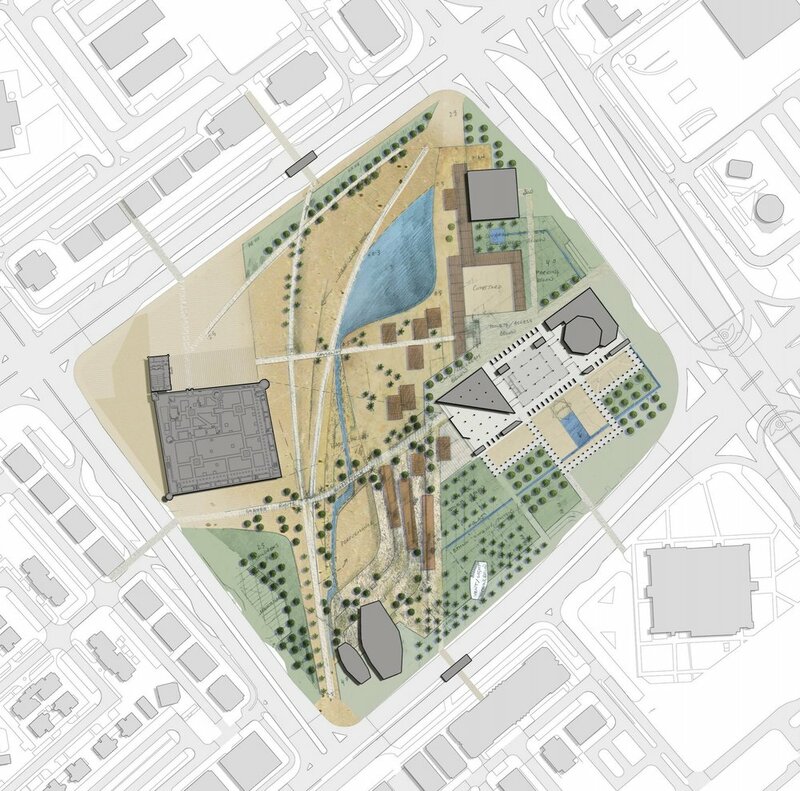 Altogether, our landscape proposals envisage using the memory of the site as a framework in which to plan cultural activities and interactive learn and play zones for children and families.